Whew. You’ve been baking, canning, and pickling up a storm these past many weekends and now you’re finally, finally ready to bestow your sweet and savory gifts on friends and family. You’re probably also a little too excited (or, er, exhausted) to bother with creating classy or clever customized labels for your gifts. We understand. Really, we do. But here’s the thing. Tempting though it may be to just hand over an unlabeled bottle or box or cellophane sleeve, would you really want your [fill-in-the-blank with friend, mother-in-law, boss, or so forth] to find a nameless jar of Bacon Jam in the fridge weeks after the holidays, puzzle at its contents, and toss it in the trash? Oh, the horror! Your solution to this predicament is our collection of not-too-precious, not-too-plain printable holiday gift tags that are equally adept at clearly identifying the Sport Pepper Sauce you made for your bro and prettifying that jar of Lemon Curd for Aunt Vi. Simply print out the gift tag templates below on sturdy paper stock, label them with your most festive script, and affix the gift tags to your goodies with a swirl of ribbon (okay, tape will do). Tada! No wonky wrapping or Martha Stewart-like hysterics required. (Oops, did we say hysterics? We meant heroics. Really.) Which means you can turn up at any party with your head held high and your arms full of incredible edibles. Just be sure to sign your name so folks know exactly whom to thank for that stash of Homemade Nutella. (As if they couldn’t guess who to thank!) Originally published December 15, 2012. Illustration © 2012 . All rights reserved. All recipes and photos used with permission of the publisher. Lindsay Myers wants to know: Is it snack time yet? Once a victim of Picky Eater Syndrome, she now enjoys jotting her culinary adventures on an ever-growing list that includes fish head curry and pudding made of honest-to-goodness plankton. Even after all those wild and wonderful tastes, however, she still believes that a piece of crisp buttered toast is the most perfect food. Lindsay lives in Seattle. You are quite welcome, Lori P. Use them in abundance! Fun post! Thanks for talking me down from any “hysterics” ledge I might have climbed on. LC, you are heroic in your own way. Cheers to you all. Aw shucks, Allison. We’re blushing. Many thanks for your generous words. Just doing what we do…. These are going to be attached to my Worcestershire Sauce, Meyer Lemon-Cara Cara Orange Marmalade, and various chutneys and other things I made this year. Truth be told, it was to relieve some boredom that they got made. Great labels, thanks. Fanny, each of those recipes sounds terrific, regardless of the reason they came to be! And you’re welcome, very glad to be of service. I am very particular about my handwriting, the pen I use, and what a gift tag looks like. (I hate store-bought ones….) These are wonderful! Not only for the holidays but all year long! I just love you guys! Aw, we love you, too, Greg! And we love your kind kudos, thank you. We’re happy to oblige and are pleased to hear they’ll be put to use…. Greg, that’s so nice of you! We’re so glad we could provide some gift tags that strike your fancy. You are so very, very welcome, Melissa! Mary, why thank you! !Such a lovely compliment. And we wish you and yours a wonderful and happy holiday season. 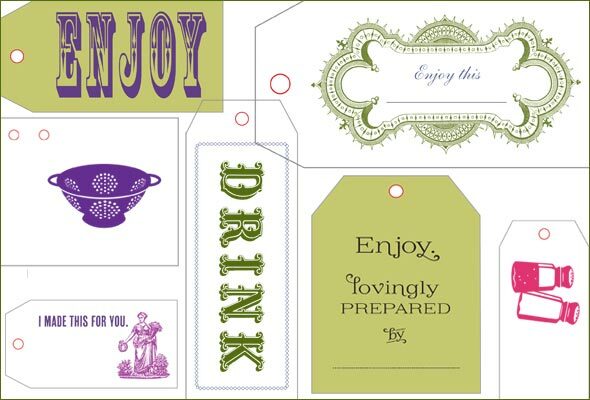 Extraordinarily beautiful foodie gift tags, I love them. Thank you. Barbara, you are more than welcome!